St. John’s (population 22,342) is the capital of the Eastern Caribbean twin-island nation of Antigua and Barbuda. Antigua, the largest of the English-speaking Leeward Islands, covers 108 square miles. Barbuda, a flat coral island with an area of only 68 square miles, lies approximately 30 miles north of Antigua. St. John’s is Antigua’s main port. Its population comprises 24% of the total population of 91,295 for the islands. St. John has been the administrative center of Antigua and Barbuda since the islands were first colonized by Britain in 1632, and it became the seat of government when the nation achieved independence in 1981. Almost all government ministries are located here and, with the government employing about 35% of the population, many Antiguans have found employment in the capital. Several major world financial institutions are represented in St. John’s. The Antigua Rum Distillery is located here also, and is the only rum distillery on the island. Exports include petroleum products, machinery, transport equipment, and agricultural produce. The nation of Antigua and Barbuda has built its economy around tourism, replacing sugar which dominated the economy from the 18th century to the 20th century. St. John’s is the center of this tourism industry which accounts for nearly 60% of GDP and 40% of investment. 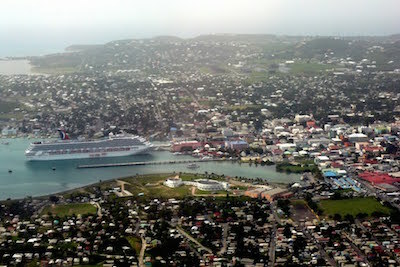 St. John’s has one of the major cruise ship ports in the Eastern Caribbean. Visitors to the island who come by ship disembark at Heritage Quay and literally step right into the heart of the city as ships dock at the pier located at the foot of the main street, Market Street. Nearby Redcliffe Quay is a beautifully restored area nestled by the docks of St. John’s. Once the slave market and rum distillery, Redcliffe Quay is now prime real estate on Antigua with a variety of restaurants and boutiques. Much of the city retains its look from the more than three centuries of British rule. The National Museum of Antigua and Barbuda and St. John’s Anglican Cathedral are major attractions. The magnificent baroque Cathedral, on a gentle slope overlooking the city and port, is St John’s most prominent landmark. Built in 1681, the church has been felled by a major earthquake in 1745 but rebuilt the following year and expanded in 1845. The National Museum of Antigua and Barbuda is housed in the colonial Court House. Constructed in 1747, it is the oldest building still in use in the city. The museum displays Arawak and colonial artifacts recovered on archaeological digs on the islands. The Arawaks were the indigenous peoples of the islands. The majority of the population of St. John’s (91%), much like the rest of Antigua, is of African ancestry. The second largest group is of mixed European-African ancestry (4%). There is a small European minority which comprises 2% and the remainder of the city’s population, about 3%, is from Asia or are the descendants of the indigenous people. Antigua & Barbuda - History & Culture - Geographia, http://www.geographia.com/antigua-barbuda/aghis01.htm; Antigua & Barbuda - Lonely Planet, http://www.lonelyplanet.com/antigua-and-barbuda; St. John's, Antigua - TripAdvisor, http://www.tripadvisor.com/Tourism-g147243-St_John_s_Saint_John_Parish_Antigua_Antigua_and_Barbuda-Vacations.html.